An old concept meets new style as The Emporium takes possibly its finest vest and gives it a new look. 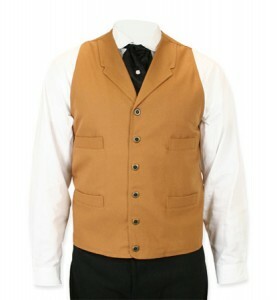 The double-breasted Cavendish vest is derived from the Walden. And just like the Walden, it has the same handsome appeal, top notch construction, and unmatched character. The neutral golden brown color, double-breasted front, and the herringbone patterned texture immediately enhances any formal or semi-formal attire paired with it. In case you can’t tell, I absolutely love this vest and I think you will too. Fabulous belt. Measurement process is perfect. I used my shotshell bag to get the proper fit/slant. Pant size is 34 but belt fit measured to 42. My Colt 45 fits perfect. Only improvement will be to upgrade the buckle to a beefy brass unit. Will also need to oil the leg strap and hammer strap so they’re more soft and flexible. Outstanding fit, finish, and gun fit! This coat blew us away. It is heavy material – not a flimsy coat. 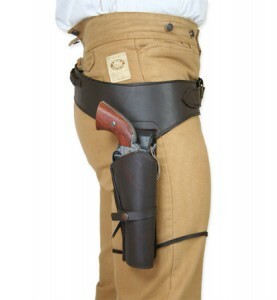 It fit perfectly, and was long enough to hit the thighs, had a split in the back- my husband wore this while we were married on horseback. The buttons on it added such a great period look to it. 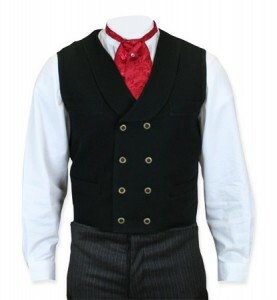 It looked great with the red vest, wing-tipped shirt, and black puff tie. It was super comfortable too!! 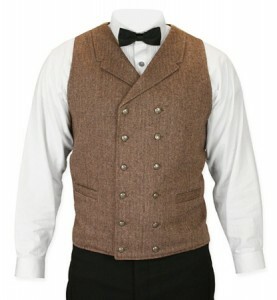 I had been trying to source vests in Australia for a number of months with no luck. I found Historical Emporium by pure chance and decided to give them a go. Shipping from the States was still more reasonable than anything that I’d been able to find in Australia. I had deliberately ordered a size up to be safe and on arrival. I was very impressed with the quality, style and the time that the vests took to jump the puddle from the US. My tailor when I went to have them taken in (yes I probably should have trusted the sizing listed) also commented on the quality and styling; when measuring and after making the adjustments. Thank you very much (and yes I’ve now ordered additional vests), highly recommend both the service and product. I’ll be back again. 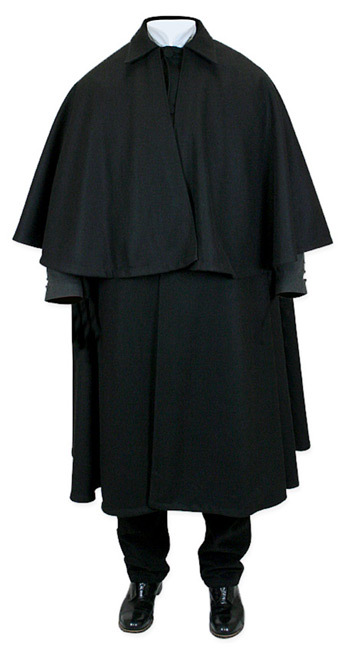 Inverness Cloak – Black Wool: Outstanding! This Inverness is an outstanding product! Ordering was easy and it arrived promptly. I’ve waited to review it because the winter has just been too warm to give it a good wearing, but I recently traveled to a cooler climate and wore it for several days. It’s a decent thickness of wool, and where the cape falls, the thickness is doubled. It is quite roomy and intended to be worn with a jacket underneath (it could also easily accommodate a thick sweater or even a heavy jacket if you needed). I wore it with only shirtsleeves and a waistcoat and was perfectly comfortable in upper 30’s weather. By the way, when the wind gusts–it’s spectacular. 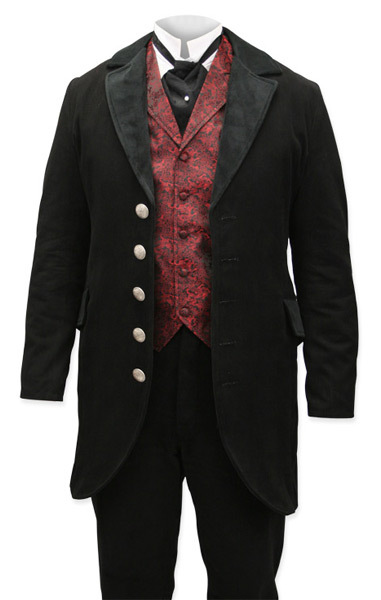 I want to stress, like most of Historical Emporium’s products, this is functional clothing–not a costume piece. It appears to be exceptionally well made. This is my second purchase from Historical Emporium and I’ve been delighted with both and look forward to making many more. I’ve wanted one of these my entire adult life–but as anyone knows they can be cost prohibitive. A wool Inverness purchased on-line through a Scottish kilt-maker could set you back close to a $900; and when I was in Edinburgh about 10 years ago, I found one in a retail outlet for 375 pounds (north of $600). Historical Emporium offers a very well made product at an incredibly reasonable price. I very much hope they come out with this wool version in other colors–say a nice brown tweed? 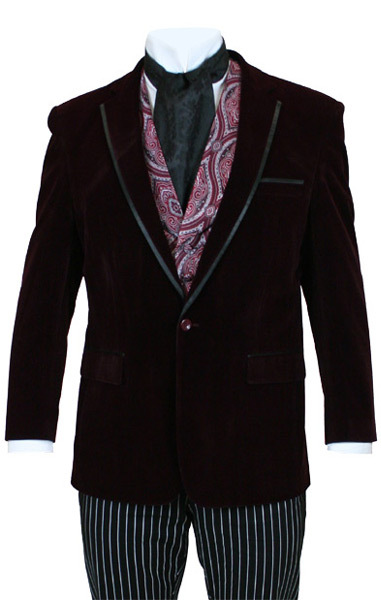 Westchester Velvet Smoking Jacket – Wine/Black: Inconceivable! A man of a certain age reflects upon his life: celebrates the victories, laments loves lost, and realizes at some point that the only thing missing is a smoking jacket; so there it is. This jacket required no tailoring for me at all; amazing. The fact that it was delivered so quickly after I ordered it makes you guys the gold standard. Great weight and style, very well made and not cheesy looking……. wore to work today and had tons of compliments………… just ordered a black one. With a starched shirt and jeans, these look killer.